The British Navy was permitted to press any British citizen anywhere in the world for service on a warship, which was essentially legalized kidnapping. Like any kidnap victim, many of the sailors ran away at the first opportunity, and they often found employment on American merchant ships, lured by the high pay and the right to leave the ship at the end of the voyage. While the American government simply required five years of residence to become a citizen, the British only recognized birth or residency in the United States since before 1783. This irritating procedure became a serious problem because of the navy’s huge manpower needs during the Napoleonic Wars (1803-1815), and thousands of men were pressed from American ships between 1803 and 1812. Free trade had also become an issue, since Britain and France were each trying to prevent neutral America from trading with the other. Although the French were willing to board American ships, the Royal Navy’s dominant position meant that American ships were much more likely to be boarded by the British, which fuelled anger against Britain in the United States. At the same time, a growing number of people in the border states were casting covetous eyes on Canada, while the increasingly powerful hawkish element of the Republican party wanted war to expand the United States and end the Indian threat, which was believed to be encouraged by the British. Motivated by the need to satisfy the increasingly hawkish base of his party in order to secure their support for the coming election, President James Madison won Congress’ permission to go to war with Britain, and the United States declared war on June 18, 1812. Angered by the Royal Navy’s frequent boarding of American ships to impress former British sailors who have become American citizens, the United States declares war on Britain in 1812. France has agreed to loan the United States $10 million in gold, so an American warship is sent to France to obtain the gold and then evade the British blockade to bring the gold to the United States. Captain James Marshall (Mark Stevens) is assigned the mission, and he takes his friend, Ben Waldridge (Patric Knowles), a disgraced former British naval captain, as his first mate. Waldridge brings part of his former crew along as his gun crew, and when they learn that the ship will transport $10 million, the gun crew immediately plan a mutiny, in order to take the gold for themselves. While in France, Waldridge restarts his relationship with his ex-girlfriend Leslie (Angela Lansbury), but she is a heartless gold-digger who conspires with the mutineers, which forces Waldridge to choose between his friend and his lover. 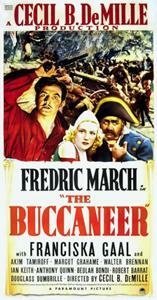 Early in the movie, an American ship is forced to allow a British warship to search its crew for British citizens. One of the seamen is a naturalized American but the British do not recognize naturalized citizens, saying “born British, British forever.” Impressment was a serious issue in the United States but it was not the sole reason why the United States declared war on Britain. The French loan is made by private citizens and must be kept secret because France was not at war with Britain. Apparently the screenwriter had never heard of Napoleon or the war between England and France that had raged for the previous decade. This is not a minor error and it would have been simpler to explain that the mission had to be secret or else every British warship would be hunting them. It may be hard to believe but an early submarine was used against the British during the war. Unfortunately, the initial attempt to sink a British warship blockading the port of New London, Connecticut ended with the death of the man operating the prototype submarine, and the survival of the ship, so the experiment was not repeated. The scenes in the submersible are some of the best in the movie. Waldridge’s gun crew resent how they have been treated by both the Royal and American navies, but this resentment is only touched upon, even though it would have added another dimension to the decision to mutiny. A member of the Hollywood Ten, the first ten unfriendly witnesses who refused to testify in front of the House Committee on Un-American Activities in 1947, director Edward Dmytryk spent a year in prison for contempt of court. Anybody who refused to swear an oath that they were not and had not been a member of the Communist Party would be blacklisted and denied work by the major film studios. Although he had publicly broken with the Communist Party after completing his sentence, job offers did not flood in, so Dmytryk happily agreed to make a low-budget movie for the King brothers. Filmed in less than three weeks, the movie is still worth watching despite the limited budget. The first half is quite entertaining due to the plotting and character development, especially since Lansbury and Knowles give excellent performances. However, Marshall’s two-dimensional heroism makes the pursuit of the ship after the mutiny dull and predictable. 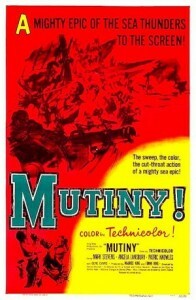 Gene Evans as Hook and Rhys Williams as Red Legs, the leaders of the mutineers, are quite good in their roles. Having watched Evans in the two Korean War films he made for Sam Fuller, The Steel Helmet (1951) and Fixed Bayonets (1951), it is interesting to see that he remains gruff even when he plays a villain. The best part of the movie is Angela Lansbury, who plays Leslie without a single redeeming feature. Although attractive, Lansbury does not have the looks of a traditional leading lady, but she proves to be a devious plotter, twisting Waldridge around her finger. Waldridge had been cashiered for stealing his ship’s payroll to pay Leslie’s debts, but he immediately falls under her spell when they re-unite. Able only to see the worst in others, she relentlessly schemes for her own advantage. A single moment of honesty occurs when she informs Waldridge that she can not live without the things that make a woman’s life worth living. Mark Stevens’ Marshall is a cardboard character, bravely risking his life to save others because he is the hero, but otherwise lacking any shred of real personality. 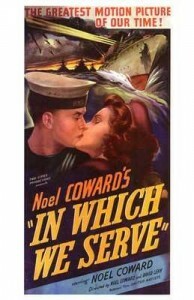 Knowles as Waldridge is far more complex, a good man but weak, who tries desperately to navigate a path between honor and his love for Leslie. 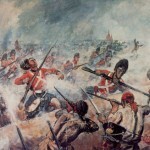 One of the handful of movies set during the War of 1812, it is simply a movie about a mutiny with better-than-average scheming.